Last March 10, the Court of Appeals (CA) denied the petition for a writ of habeas corpus by the 43 health workers who were abducted, tortured, and remain under military detention since February 6. The CA invoked the so-called “Ilagan Doctrine” in its decision. A habeas corpus refers to a legal action through which a person can seek relief from unlawful detention. It is considered an important instrument in safeguarding individual freedom from arbitrary state action. Meanwhile, the Ilagan Doctrine is a legal principle established by jurisprudence. It states that a writ of habeas corpus is no longer available after criminal information is filed against the person detained and an arrest warrant or a commitment order is issued by the court where the said information has been filed. Thus, under the Ilagan Doctrine, the unlawfulness of an arrest becomes moot and academic or an illegal arrest becomes “legal” once charges are filed in a court of law. This legal principle is a remnant of the Marcos dictatorship. It was promulgated by the Supreme Court in an October 21, 1985 decision on the Ilagan v. Enrile case. Ilagan refers to Laurente Ilagan, a legal luminary in Davao City and former chairperson of Bagong Alyansang Makabayan (Bayan) Mindanao who was arrested without warrant together with fellow lawyers Antonio Arellano and Marcos Risonar by the Philippine Constabulary – Integrated National Police (PC-INP). Enrile refers to then Minister of Defense (and now Senator) Juan Ponce Enrile. Rebellion, economic sabotage, CPP leaders? Ilagan, Arellano, and Risonar were arrested by the PC-INP on the basis of a Preventive Detention Action (PDA) issued by the late strongman Ferdinand Marcos on January 25, 1985. A PDA legitimizes a warrantless arrest. First to be arrested and detained in Camp Catitipan, Davao City was Ilagan on May 10. Arellano, meanwhile, was arrested when he and 14 other lawyers from the Davao chapter of the Integrated Bar of the Philippines (IBP) visited Ilagan on the same day. Risonar was arrested on May 13 when he visited Camp Catitipan to verify his arrest papers. They were arrested, according to then Brig. Gen. Dionisio Tan-Gatue, PC-INP Region IX Commander, for alleged “specific acts of rebellion and economic sabotage as well as for their leadership in the Communist Party of the Philippines (CPP)”. He cited as well the participation of the detained lawyers in a Welgang Bayan (People’s Strike) in Davao City. Gen Tan-Gatue also accused the three of “using their profession as lawyers as cover-up for their activities in furtherance of CPP goals and objectives”. Lawyers for Enrile, Gen. Tan-Gatue, and then acting Chief of Staff of the Armed Forces of the Philippines (AFP) Lt. Gen. Fidel Ramos, named respondents in the case, justified the arrest and detention of the lawyers by contending that it was conducted under a PDA; that the writ of habeas corpus was suspended by virtue of Proclamation 2045-A; and that courts do not have the authority to inquire into the cause and validity of detention of persons held pursuant to the suspension. While justifying the arrest and detention of the lawyers as legitimate because of the PDA and Proclamation 2045, the military’s lawyers filed an information for rebellion against the detained attorneys before the Regional Trial Court of Davao City Branch X on May 27, 1985 or 17 days after Ilagan was arrested, which then became the basis of a warrant of arrest. No preliminary investigation was conducted. Lawyers of the military then asked the SC to dismiss the petition for a writ of habeas corpus because it was supposedly already rendered moot and academic by the said filing of information. During the first hearing on the habeas corpus petition on May 23, 1985 the SC actually ordered the immediate release of the detained lawyers on recognizance of their principal counsels – former Chief Justice Roberto Concepcion and retired Associate Justice Jose B.L. Reyes. But the military refused to honor the SC order to immediately release the detainees with military officials saying that it had to be verified from higher authorities. Then, as already mentioned, a case was hastily filed before a trial court in Davao City four days later. Aside from former Chief Justice Concepcion and former Associate Justice Reyes, other legal luminaries who stood as counsels for the detained lawyers were Raul Roco, Joker Arroyo, Haydee Yorac, Frank Chavez, Lorenzo Tañada, Wigberto Tañada, Fulgencio Factoran, and Martiniano Vivo. They argued that the arrests were illegal; that the Welgang Bayans were in legitimate exercise of the constitutional right of expression and assembly to petition the government for redress of grievances; that the detained attorneys’ participation was limited to serving in the legal panel and the negotiating panels; that Proclamation 2045 was unconstitutional because there exists no factual or legal basis for the suspension of the writ of habeas corpus as provided for in the 1973 Constitution; that the evidence presented by respondents against the detained attorneys were of a doubtful and flimsy nature; and that the PDA was unconstitutional because it violates the 1973 Constitution prohibiting unreasonable searches and seizures. But on October 21, 1985, the SC ruled that the petition for habeas corpus was already moot and academic since Ilagan, Arellano, and Risonar were detained by virtue of a warrant of arrest by Regional Trial Court of Davao City in relation to a criminal case of rebellion filed against them before the said court. It argued that the function of a special proceeding of habeas corpus is to inquire into the legality of one’s detention. But because the detained lawyers’ incarceration was already by virtue of a judicial action in relation to a criminal case, no matter if such case was filed more than two weeks after the arrests were made, the remedy of habeas corpus supposedly no longer applies. The SC added that questions to the legality of the arrest or lack of preliminary investigation should be addressed to the Davao City trial court. Ten justices voted for the dismissal of the petition, namely Chief Justice Felix Makasiar and Associate Justices Efren Plana, Venicio Escolin, Lorenzo Relova, Hugo Gutierrez Jr., Buenaventura Dela Fuente, Serafin Cuevas, Nestor Alampay, Carolina Aquino, and Amurfina Melencio-Herrera. Three Associate Justices, however, offered dissenting opinions – Claudio Teehankee, Hermogenes Concepcion Jr., and Vicente Abad Santos. “More than four agonizing months after this Court issued its near unanimous Resolution… ordering the immediate release of the three petitioners-detainees… this Court has now refused to enforce its own release order… It has instead dismissed the petition for habeas corpus for having become moot and academic because of the arbitrary filing of precipitate, vindictive, and oppressive charges against them for the capital crime of rebellion without hearing or preliminary investigation and in gross violation of their constitutional right and rudimentary requirements of due process and fair play”. Ilagan, Arellano, and Risonar were flatly denied of their constitutional rights and the right to due process and fair play in an era when the military, under the patronage of a dictator, ruled the country. Today, military rule supposedly no longer reigns and we enjoy supposedly the best constitution in the world in terms of human rights protection. And yet we have the case of the Health 43 who will remain in military detention and whose rights will be continuously violated because of a Marcos-era legal doctrine. As renowned human rights lawyer Atty. Romeo Capulong noted, the CA, “in simply adhering to the outdated Ilagan v. Enrile… disregarded the litany of blatant violations of the constitutional rights of the(se) 43 health workers from the time that they were unlawfully arrested and the continued abuse of their basic human rights in the hands of the military”. He called the Ilagan Doctrine “a tool of the government, the AFP, and the Philippine National Police (PNP) to carry out the unlawful warrantless arrest and arbitrary detention of members of progressive organizations”. 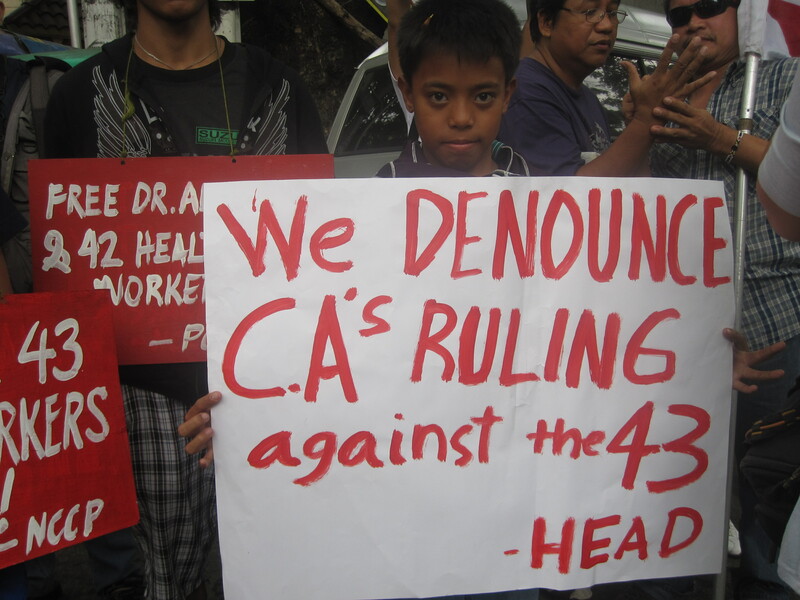 On March 11, lawyers of the Health 43 filed an appeal to the SC to reverse the CA decision denying the petition for a habeas corpus. But as in most human rights cases, the struggle is not simply legal but political. There must be public pressure strong and broad enough for the SC justices to seriously rethink or junk altogether the Ilagan Doctrine and free immediately the 43 health workers. This was labeled after my father was arrested during the Marcos Years. It pains me that the law was named after him in reference to the resolution. The Ilagan Doctrine is a blatant display of the military might over justice. In places where free thinkers are abundant and justice & equality is regarded highly, it is most depressing to see that this practice of injustice is still being allowed to happen. It seems that the law here is still bent according to the authorities in power and democracy and justice is merely a word in the dictionary. When will our country ever learn? On the other hand the Ilagan Doctrine is a legal principle established by jurisprudence which states that “a writ of habeas corpus is no longer available after criminal information is filed against the person detained and an arrest warrant or a commitment order is issued by the court where the said information has been filed”. Thus, under the Ilagan Doctrine, the unlawfulness of an arrest becomes moot and academic or an illegal arrest becomes “legal” once charges are filed in a court of law. Contrasting Section 1 and 2 above of the constitution against the Ilagan doctrine we can see that the said doctrine should have been invalidated by the passage of the 1987 constitution. Why ??? Because the Ilagan doctrine provides the state or its forces with a mechanism to invalidate the above sections of the bill of rights. Firstly, the doctrine effectively legalizes what was illegal. It allows state forces to arrest anyone with no probable cause. Secondly, at the instance of the arrest the Ilagan doctrine grants to state forces no liability for the violation of the rights of the arrested person. The arrest being itself an illegal act and no remedy is available against said illegal act. Thirdly, the doctrine provides no clear time limit for the filing of cases against the person arrested. The person arrested can be detained indefinitely before the filing of a case. Fourthly, it deprives the arrested person the right to a presumption of innocence. if there is no probable cause for the arrest the person arrested is already deprived of liberty without due process. Therefore, I say that the Ilagan doctrine is already invalid !! !